The final decision was made by a public vote and our winner was. . . While winter wheeling with a friend in New Hampshire’s White Mountains my Jeep broke through thick ice of a frozen-over river, requiring recovery from my buddy’s JKU. I took a moment to photograph him pulling the FlatLink at the end of his winch line towards the Grand Cherokee to pull me back safely. Thanks to Warn, Factor55, and Black Oak LED for making this a painless process despite the cold temps, fresh snow, and pitch black night! Equipment: Handheld on a Canon 6D, 24-70mm at 70mm, f/2.8, ISO200, 1/50” exposure. Ryan plans to use his Grand Prize of an Overland Experience package + Guest to attend Overland Expo EAST 2018 with his wife! Thank you for the spectacular and inspiring entries everyone, you make our jobs harder every year. And huge thanks to everyone who voted for helping us decide. Still need some unique gift ideas for people who like to get out there? 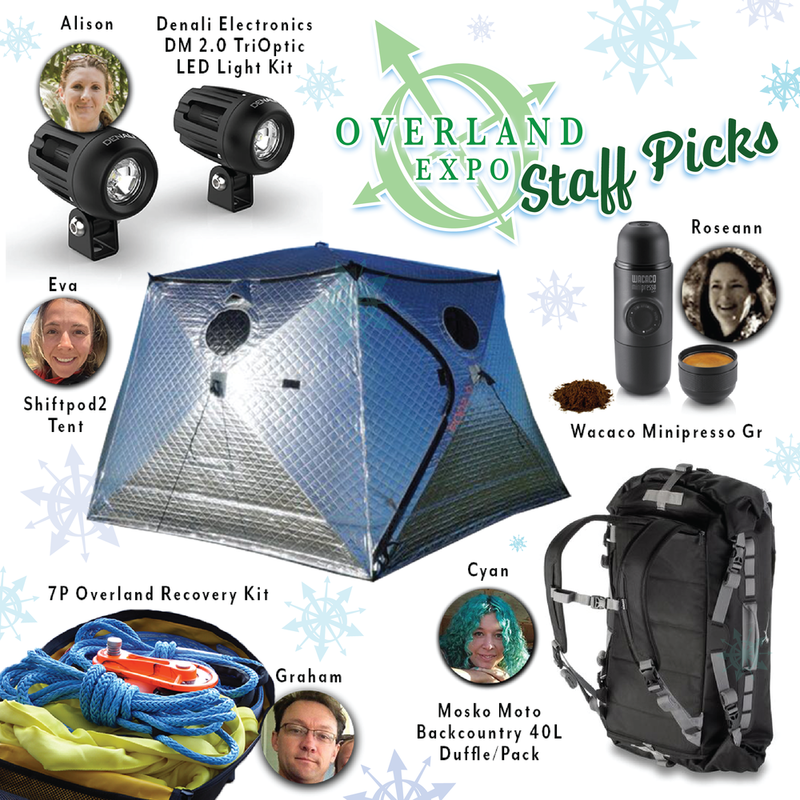 Check out our staff picks below or scroll for great gifts through our exhibitor pages for Overland Expo EAST and WEST. One gift sure to please? Tickets to Overland Expo WEST or Gift Certificates for either show! Real espresso on the road. Just 360 grams (3/4 pound), this little coffee maker cranks out real espresso—with crema—in a few minutes using boiling water and a hand-operated pressurizing button. It’s even compact enough to take on a motorcycle. Heat up some milk and use a little battery frother and you have great lattes . . . ingenious. Forget about candy canes and sweaters, give the overlanders in your life what they really want. . .tools for more adventure! Check out our staff picks below and peruse our exhibitor pages for Overland Expo EAST and WEST for more great ideas. Or give the gift of hands on training with Overland Experience tickets to Overland Expo WEST! Storm Relief Donation Collection at Overland Expo EAST! The Overland Emergency Response Network is an organization dedicated to helping first responders and families alike deal with the aftermath of a large scale storm. The network's ultimate goal with time, is to deploy teams of overlanders versed in a multitude of disciplines that will make them a valuable tool to first responders. At the moment, they’re organizing donation drives on both the east and west coast. Overland Expo has donated a booth space at our east show for them to collect goods for their current relief efforts and make connections which will help their vision for the network reach its full potential going forward. What is there for motorcyclists to do at Overland Expo 2017 EAST? We have lots of activities to choose from: Slideshows to demos to skills challenges and more! 1000 Reasons to Attend Overland Expo! Brought to you by Simon and Lisa Thomas, 2RidetheWorld. Do you fancy yourself an amazing outdoor chef? Do your friends invite you on overland trips to benefit from your cooking 🍳 skills? If you answered "yes", you need to register for the first annual Overland Expo Chef competition at Overland Expo 2017 EAST! Mark Harley of @metaltech4x4 is hosting this cooking competition on Friday, Sept 29 from 2-5 on Day One of Overland Expo EAST. Gather your teammates (1-3 people) and get ready to make one savory and one sweet dish using the secret ingredient. Besides bragging rights, the winning team will receive championship chef aprons and patches! Ready to register? Just email Mark at expochef@metaltech4x4.com. There are five more spots available out of seven. Which chef team will reign supreme? This year's Change Your World Fund raffle will take place on Friday evening, September 29, 2017, at 7:00 pm in the Overland Theater. Buy a raffle ticket that benefits a great cause AND get a chance at nearly $8,000 in incredible prizes from exhibitors such as Rhino-Rack, Dometic, Bundutec USA, CampMaid, Sam Manicom, and explmore- just to name a few! Raffle tickets are on sale online (scroll down to Raffle Tickets) now $20 for 5 or $50 for 15 and at Overland Expo EAST. You must be present to win. 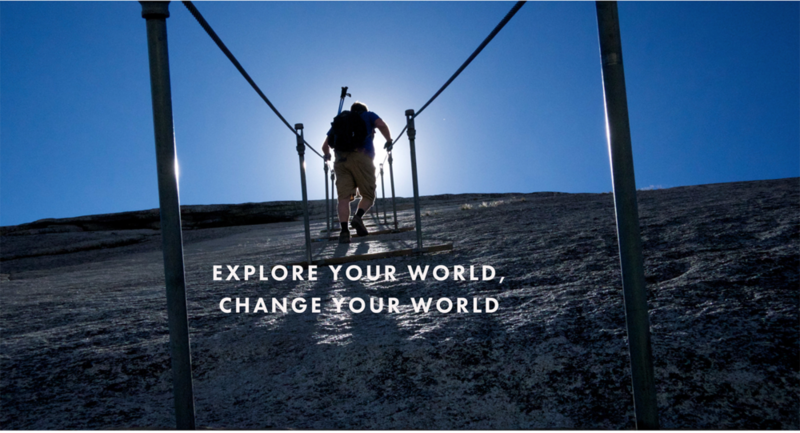 You'll also be able to meet the travelers from the Change Your World Fund Class of 2017 - a grant program designed to get millennials out exploring the world and giving back as they go. Learn more about the program here. Special Motorcycle Activities Add-On Ticket! ADD ON EXTRA MOTO FUN FOR ONLY $45! and much, much more, hosted by ADVMoto Magazine. We've also added an improved Motorcycle Expedition Skills Area. We've taken our training in-house to create specialized classes for the ultimate expedition training program, and added exciting evening options for motorcyclists. Whether you're training for an international adventure or staying local and just want to come out and play in the dirt, we have something for everyone. Please note: All tickets must be bought in advance (no at-gate sales)! Overland Expo EAST tickets include a visit to the Biltmore house! Are you joining us at the Biltmore for Overland Expo 2017 EAST? Any Overland Experience package or Weekend Pass (with or without camping) ticket includes the entrance to the Biltmore Estate AND a visit to the Biltmore house. (Day Passes will get you entrance to the Estate, but NOT the house.) There are no additional fees this year, so the price you see is the final cost. Taking a tour of the house is always optional and if you've never seen it before, we highly recommend the experience! Branden Powell's 1972 Pinzgauer 710M! - Rugged Radios "Ultimate Headset" - to more easily communicate with a team leader when transporting a team in the back of the Pinz.